HHT Mount Kailash Trek 2019! This trekking itinerary contains an optional add–on cultural extension to Xi'an, China, beginning on Day 22. 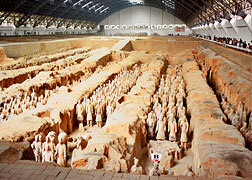 Xi'an is an ancient city with many profound archeological treasures such as the famous Terracotta Warriors. for the start of the trek program and will depart China from Xi'an after the extension. 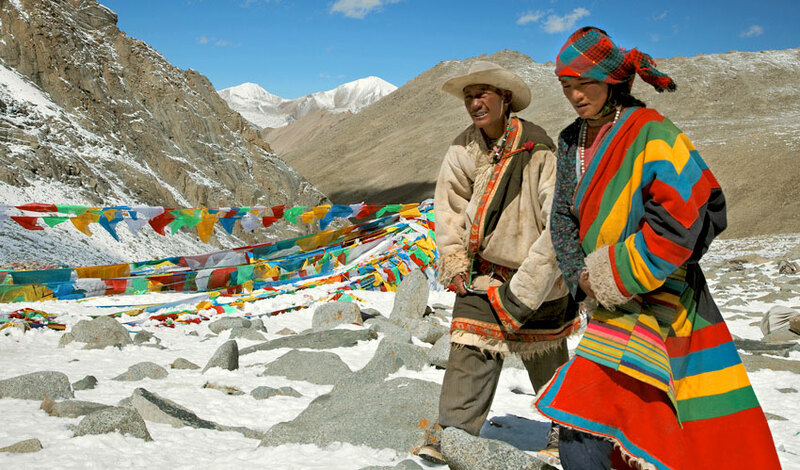 Overview: Join us for this cultural and outdoor exploration of Tibet and its famous Mount Kailash trek. We'll begin with a flight to Lhasa, Tibet and continue on to Shigatse and Gyantse, with sacred Mount Kailash as our goal. In addition to a Kora (pilgrimage) around Mount Kailash, this trip includes an informative visit to the ancient kingdom of Guge and time to sightsee in Chengdu and Lhasa. The trek is short (three days) but strenuous (six to eight hours per day) and much of the hiking is on rugged and exposed trails at high elevation (13,000 to 18,000 feet). Landslides, weather or political conditions may cause detours, delays or turning back. This trip is appropriate for fit hikers with some altitude experience who are prepared to "rough it." Conditions in Tibet are variable — so be prepared for changes in weather, some unpleasant toilet facilities and the possibility of sickness. Travel in Tibet is an adventure! 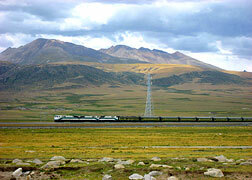 After its long isolation, Tibet promises exciting travel experiences and memories. 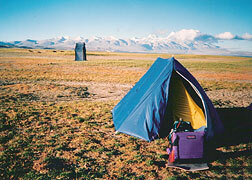 With flexibility, you will enjoy and long–remember the challenge and mystery of trekking to Mount Kailash. Pre Trip Days: Fly to meet in Chengdu, China. Those in the Americas 'lose' one day crossing the international date line. If you wish to arrive early, with advance notice we can arrange an early airport transfer and accommodations. Please note that you must arrive in Chengdu, China. Day 1: Group arrival day in Chengdu, China. Our staff will wait for your arrival outside the secured area of the Chengdu Shuangliu International Airport — after you collect your luggage and proceed through China customs. Look for our guide holding a sign that says "Himalayan High Treks." You will transfer to your hotel for check-in. Chengdu, at only 1,640 feet of altitude, is the capital of the Sichuan province, located in China's southwest and known as the 'land of abundance.' It is the home town of the Giant Panda, the city of Brocade, the city of Sichuan cuisine and the city of leisure. 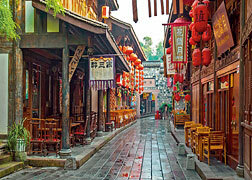 Day 2: Following breakfast, enjoy a full day in Chengdu. We first visit the world's largest park for the giant panda — with more than 150 giant pandas. It is a 40 minute drive to reach the park, located in the north side of the city. Enjoy two to three hours at the center, strolling through its bamboo forest, with lunch at a Sichaun hotpot restaurant. 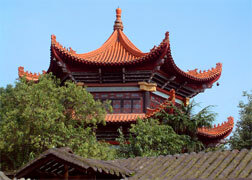 Wenshu Temple (also called Manjushri Temple), is one of China's most-famous and best-preserved Buddhist temples. It is found in a unique place in downtown where people relax in their spiritual world within a solemn and holy place. Day 4: Our first days at high altitude will involve only gentle touring and exploration. After breakfast this morning we will visit Drepung Monastery (literally "Rice Heap" Monastery). 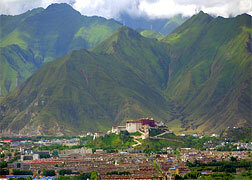 Drepung is the largest of all Tibetan monasteries and is located on the Gambo Utse mountain, five kilometers from Lhasa. It was founded in 1416 by Jamyang Choge Tashi Palden (1397–1449). It was known for the high standards of its academic study and was called the Nalanda of Tibet, a reference to the great Buddhist monastic university of India. 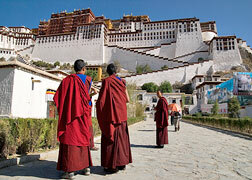 Day 5: Today we explore Lhasa including the Jokang Temple and the majestic 13-story, 1,000-room Potala Palace. 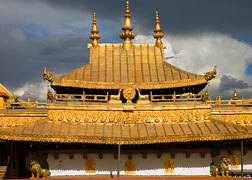 Tibetans, in general, consider Jokang Temple as the most sacred and important temple in Tibet. 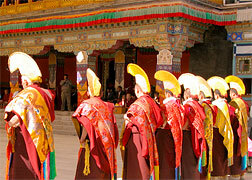 Jokang is run by the Gelug school, but worshipers from all Bhuddist sects visit the temple. The oldest part of the temple was built in 652 by Songtsen Gampo. During the Cultural Revolution, Red Guards attacked the Jokhang in 1966 and for a decade there was no worship in Tibetan monasteries. Renovation of the Jokhang began in 1972, and was mostly complete by 1980.It's architectural style is a mixture of Indian, Tibetan and Nepalese design. Potala Palace is named after Mount Potalaka, the mythical abode of the bodhisattva Avalokitesvara. The 5th Dalai Lama started its construction in 1645 after one of his spiritual advisers, Konchog Chophel, suggested that the site was ideal as a seat of government — situated as it is between Drepung and Sera monasteries and the old city of Lhasa. It is thought to overlay the remains of an earlier fortress called the White or Red Palace, built by Songtsän Gampo in 637. The external structure was built in three years, while the interior, together with its furnishings, took 45 years to complete. The Potala Palace became a UNESCO World Heritage Site in 1994. Day 6: After breakfast today, we visit Ganden Monastery located at 12,467 feet. 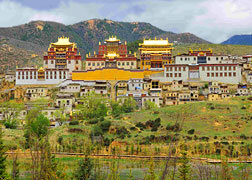 Ganden (also Gaden, Gandain or Ganden Namgyeling) is the third of the "great three" Gelug University Tibetan Monasteries. 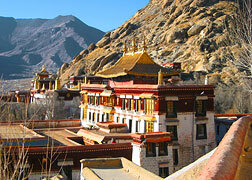 Ganden Monastery was founded in 1409 by Je Tsongkhapa Lozang-dragpa, founder of the Gelug sect. 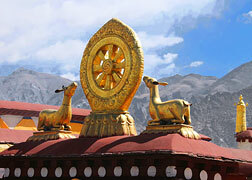 Tsongkhapa built Ganden's main temple, with large statues and three-dimensional mandalas. He often stayed at Ganden and died there in 1419. Ganden Monastery was completely destroyed during the rebellion of 1959. In 1966 it was severely shelled and buildings were reduced to rubble during the Cultural Revolution (1966–76). Rebuilding has continued since the 1980s. 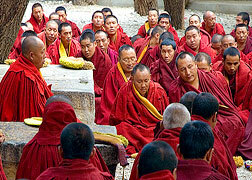 Recently there were about 400 monks, and rapid progress was being made on rebuilding the monastery. Day 7: This morning after breakfast we will drive, with our guide, about four hours to Gyantse. On the way, we'll stop at Yamdrok Lake (at 14,570 feet), one of the three large sacred lakes in Tibet. 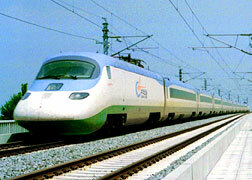 It is over 45 miles long and surrounded by snow-capped mountains. 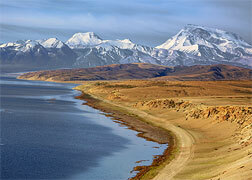 According to local mythology, Yamdok Yumtso Lake is the transformation of a goddess. 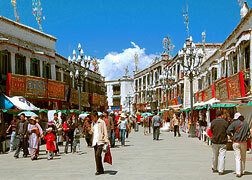 Around 56 miles to the west of the lake lies the Tibetan town of Gyantse. We then visit the Phalkor Chode Temple Complex (also called Palcho Monastery or Shekar Gyantse), the main monastery in Gyantse County, Shigatse Prefecture, in the Nyangchu River Valley. The monastery is a complex of structures most notable for the 108 chapels in its several floors and the old Dzong or fort. The Tsuklakhang, the main temple of the monastery, was built between 1418–1428 by Rabten Kunzang Phak, the second Prince of Gyantse. It became an important center of the Sakya sect of Tibetan Buddhism but was partially destroyed in 1959 after the revolt and was again ransacked during the Cultural Revolution, but has since been largely restored. Prior to the uprising there were 1520 monks in residence but now they number less than 80. Gyantse Dzong (or Gyantse Fortress) is one Tibet's best preserved dzongs, perched high above Gyantse on a huge outcrop of grey-brown rock. 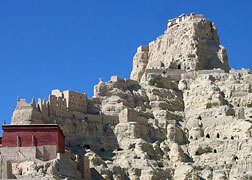 The fortress was constructed in 1390 to guard the southern approaches to the Tsangpo Valley and Lhasa. The town was surrounded by a wall almost two miles long, with an entrance on its eastern side. Day 8: Today after breakfast, we drive about one hour to Shigatse (12,800 feet). The Tashi Lhunpo Monastery was founded in 1447 by the 1st Dalai Lama and is a historic and culturally important monastery in Shigatse, the second-largest city in Tibet. The monastery was sacked when the Gorkhas invaded Tibet and captured Shigatse in 1791 before a combined Tibetan and Chinese army drove them back to the outskirts of Kathmandu, Nepal. Located on a hill in the city center, the full monastery name in Tibetan means "all fortune and happiness gathered here" or "heap of glory." Tashi Lhunpo originally housed over 4,000 monks and had four Tantric colleges, each with its own Abbot. In 1960, the monastery was dismantled by the Chinese army, although less damage was inflicted on this monastery than on others around Tibet. During the 1960s many senior lamas and monastics left Tibet and helped re-establish monasteries in India, Nepal and Bhutan. The late Panchen Lama did not leave Tibet and consequently many of the senior lamas from Tashi Lhunpo Monastery remained inside Tibet. Day 9: Today after breakfast we have a long drive across the Tibetan Plateau to Saga (about seven hours drive, 308 miles). The rest of today will be at leisure to acclimatize to our altitude of 15,223 feet. During your long drive over the sandy and rocky plateau of Tibet, you will pass near lakes and observe scenes of Tibetan nomadic daily life. Saga ('happy land') straddles the Dargye Tsangpo River above its junction with the Brahmaputra River. Day 11: Today after breakfast we drive about four hours to Lake Manasarovar. 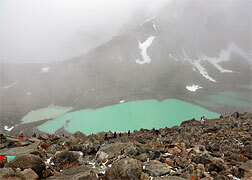 The lake lies at an altitude of 15,060 feet and is 55 miles in circumference. Buddhists associate Lake Manasarovar with the legendary lake Anavatapta where Maya is believed to have conceived Buddha. The lake is very popular in Buddhist literature and associated with many teachings and stories. Buddha, it is reported, stayed and meditated near this lake on several occasions. 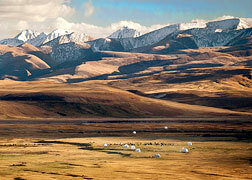 Lake Manasarovar is also the subject of the meditative Tibetan tradition, "The Jewel of Tibet". Day 12: After breakfast we drive about six hours to reach Tsaparang. This was the capital of the ancient kingdom of Guge in the Garuda Valley (through which the upper Sutlej River flows) in Ngari Prefecture near the border of India. Tsaparang is a huge fortress perched on a pyramid-shaped rock rising about 500 to 600 feet at the end of a long narrow spur. It contains numerous tunnels and caves carved out of the rock. At its base was a village where the common people lived. Above them were two public temples — the Lhakhang Marpo (Red Chapel) and the Lhakhang Karpo (White Chapel), and quarters for the monks. Further up, ascending a twisting stone staircase in a tunnel, were the royal quarters, and at the very top, the summer palace. Day 13: This morning, we will enjoy a guided tour of Tholing and in the afternoon visit the Tholing Monastery, one of the most important in the all of western Tibet. 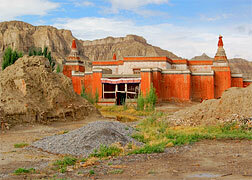 Tholing Monastery is the oldest monastery (or gompa) in the Ngari Prefecture. It is situated in Tholing (Zanda), in Zanda County, near the Indian border of Ladakh. In Tibetan language 'Tholing' means "hovering in the sky forever" and is reflected by the location of the monastery at an elevation of 12,400 feet. The complex includes three temples, the Yeshe-O Temple, the Lhakhang Karpo and the Dukhang. Inside are many ancient, precious, and well-preserved frescoes. The monastery was built in 997 AD by King Yeshe-Ö, when Tholing was the capital of Guge. Two chapels, dated to the fifteenth century, were used to store grains during the Cultural Revolution. Both have notable murals but those at Lakkhang Karpo are best known. 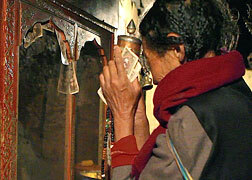 Tholing became a portal to Tibet for Indian scholars to visit and study Buddhism. During the years of the Cultural Revolution, the temples were destroyed or left to weather in the elements.Today, the monastery is mostly in ruins but retains many images and well-preserved murals made in the west Tibetan style. Day 14: After breakfast today, we drive about four hours to the Garuda Valley. Garuda Valley (or Khyunglung) is an ancient complex of living caves and meditation caves set in the mountains on the north bank of the Sutlej River. The Sutlej River is the holy river which starts from Mount Kailash. The living caves of Garuda Valley are small and have a small raised fireplace at the far end. However, almost without exception, they have no chimney. The blackened ceilings make it clear that the smoke exited the cave through the only entrance, making the cave thick with smoke when the fire was in use. Next, drive to the nearby Tirthapuri Hot Springs. Located on the north bank of the Sutlej River, the Tirthapuri Hot Springs waft up the barren landscape with a mystical steam. Pilgrims often come here after completing their Kailash pilgrimage. They bathe in pools fed by the sacred springs, then visit the cave and monastery associated with Guru Rinpoche. Prayer flags stretch across the river gorge and chortens (stupas) add color to the landscape. Day 15: This is the first day of our Kailash Parikrama (kora). Today we start very early after breakfast. 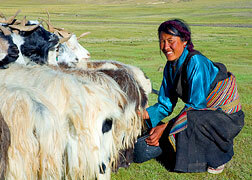 Yaks will carry all our baggage and equipment while we are on the kora. You only carry a day pack with water, snacks, camera and essential personal items. We first make a short drive of about eight miles to reach the Tarboche, our starting point for the trek around holy Mount Kailash. This first day of your kora is a gradual walk lasting about seven hours at a distance of eight miles. Today you will be among many pilgrims hiking, chanting and praying. Our hike will take you to Diraphuk (15,945 feet) where we see our first view of the north-west face of Mount Kailash. Mount Kailash is known to Tibetans as "Khang Rimpoche" (precious jewel of snow). Tibetan Buddhists, like the Hindus, recognize it as an earthly Mount Meru (the spiritual center of the universe). Four major rivers originate near here: the Indus, the Yarlung Tsangpo, the Karnali and the Sutlej. 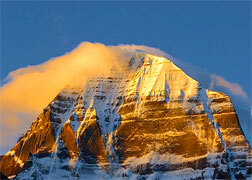 Mount Kailash is associated with Milarepa, a poet who spent several years meditating in a nearby cave. Day 16: Rising early, we again enjoy an early breakfast so we can begin today's long trek. We'll hike for about eight hours today for a total of 13.7 miles to reach the higher side of the mountain, just under the grandeur of Mount Kailash. 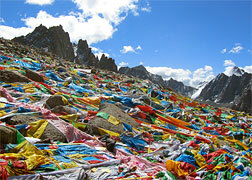 Climb past piles of clothing left ceremoniously by Tibetans at the Shiwachal cemetery (17,482 feet). They shed some clothing here as a personal symbol of leaving their past life behind. Along the way we pass the reddened footprint of Milarepa embedded in a rock. We continue up to the Drolma La Pass (18,200 feet), the spiritual (and physical) 'high point' of our trek. There, a big prayer-flag-covered boulder crowns the pass. Day 22: This morning after breakfast, transfer to the airport for your return flight to Chengdu. on train Z266 at 12:45PM, arriving in Xi'an tomorrow evening, Day 23. We offer this optional program extension to our Mount Kailash trek — descending from Lhasa and across the Tibetan Plateau, journeying 1,780 miles on an overnight, high-speed train adventure — culminating in a fascinating cultural visit to the remarkable city of Xi'an. 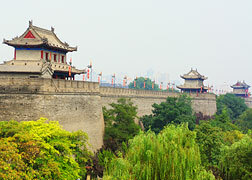 Xi'an is over 3,000 years old and was known as Chang'an in ancient times. For 1,000 years, the city was the capital for 13 dynasties, and a total of 73 emperors ruled here. Xi'an is the root of Chinese civilization, having served as the capital city for the Zhou, Qin, Han, Sui and Tang dynasties. With so much history, it's no wonder there are so many historical ruins, museums and cultural relics found here, at the eastern terminus of the Silk Road. Here, traders from far and wide brought goods and ideas for sale and took goods and ideas back with them to their native lands. The glory days of Xi'an may have ended in the early 10th century, but much of ancient Chang'an, the former city, survives behind the often bustling and modern city. Our brief visit presents the highlights of this ancient capital — the Terracotta Warriors, the History Museum, the Big and Small Wild Goose Pagodas, the Great Mosque, Mount Huashan, the city wall and much more. Day 24: Xi'an. Your guide will meet you at your hotel at a pre-arranged time (by 9:00 AM). 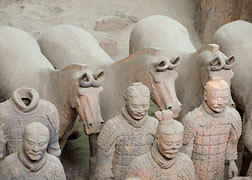 Our morning program will first visit the famous Terracotta Warriors and Horses. The Terracotta Warriors represent the most significant archeological excavations of the 20th century. Located east of Emperor Qin Shi Huang's mausoleum, the well-known warriors were buried underground 2,200 years ago — meant to protect the afterlife of Emperor Qin Shi Huang. There are more than 8,000 life-sized terra-cotta figures of soldiers and horses excavated from this area. These incredible figures, dating from the late third century BC, were discovered in 1974 by local farmers in Lintong District, Xi'an, Shaanxi province. The figures vary in height according to their roles, with the tallest being the generals. These terracotta figures include warriors, chariots and horses. 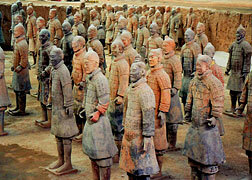 It is estimated that the three pits containing the Terracotta Army held more than 8,000 soldiers, 130 chariots with 520 horses and 150 cavalry horses, the majority of which still remain buried in long trenches located near Qin Shi Huang's mausoleum. Other non-military figures were found in other pits and include officials, strongmen, acrobats, and musicians — paint patches hint at once-colored clothes. After a full morning exploring the magnificent warriors and museum, enjoy a Chinese lunch at a special restaurant. This afternoon, we continue with a nearby visit to Emperor Qin Shi Huang's Mausoleum. This fascinating mausoleum was constructed over 38 years, from 246 to 208 BC, and lies underneath a 249-foot-tall tomb mound shaped like a truncated pyramid. 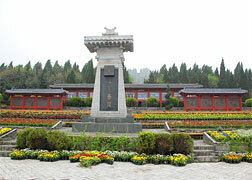 The mausoleum is modeled on the Qin capital Xi'anyang, divided into inner and outer cities. The circumference of the inner city is 1.55 miles and the outer is 3.9 miles. The tomb is located in the southwest of the inner city and faces east. The main tomb chamber housing the coffin and burial artifacts is the core of the architectural complex of the mausoleum. Post Trip: Same day return date for Americans crossing the international date line — to arrive home about midday. A day filled with wonderful memories of new faces and places you'll never forget! Important Note: This itinerary is only meant as a guide to the plan of our trek. Changes can occur as we go and are based on local conditions, acclimatization, health and fitness levels, etc. Times and elevations noted here are all rounded off. Be aware that conditions in Tibet are very rugged. Roads are unpaved and vehicle maintenance can be required at any time. This is a strenuous trek with environmental exposure on trails and bridge crossings. Landslides may cause detours. This will be an amazing experience if you enjoy nature and prepare for physical activity and the outdoors. There can be abrupt weather changes, rustic toilet facilities and exposure to the elements. Tibet tourism is controlled by the Chinese government and is completely subject to the authority of local tourism authorities. Changes in their regulations may cause cancellations or rerouting. 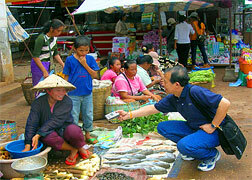 You will enjoy the challenge of this trip creating many fond memories and great pictures. It's the experience of a lifetime! Travel Details: When arranging your flights to and from our Tibet travel points, please note these dates and logistics: All participants must arrive in Chengdu, China by day 1. 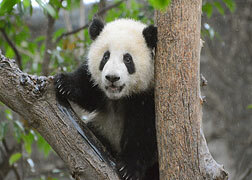 Those participating only in the main trek program should not depart Chengdu earlier than day 25. 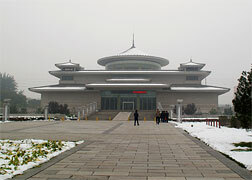 Participants in the optional Xi'an extension should not depart Xi'an earlier than day 25. Participants in the optional Xi'an extension arrive in Chengdu but depart from Xi'an! Please ask any questions before purchasing your international tickets. 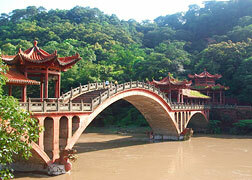 Flight times to Chengdu will vary greatly based on your origin city as well as the airline(s) being chosen. For some, air travel starting from your home country could begin two days before the meeting date in Chengdu. Crossing the International Date Line can seem as if you 'lose' a day flying but on your return home, you may arrive on the same day, often just hours later than the local time of your departure. You are welcome to travel early or stay for extra days at the end. We can arrange additional nights at any of our hotels or guest houses for you. Contact us with your specific interests and budget — we can help make it happen! Please refer to the booking information section of our application form for more information. Passport, Visa(s), Physicians Visit, Emergency Medical & Evacuation Insurance, Travel to/from Chengdu/Xi'an, Meals Beyond Above Itinerary, Beverages, Spending/Personal Money. Strenuous: Usually involves high-altitude hiking along rugged trails and crossing passes as high as 18,200 feet. Weather can be variable and snowfields may be encountered. Daily hiking is extensive — sometimes for as much as eight or nine hours. This trip is long in overall duration and designed for experienced hikers who want to be challenged. No technical climbing skills are needed and days for rest are appropriately included, but overall, this trip is arduous and meant for hearty hikers.